Portugal has a bad record for road safety and a reputation for being a dangerous place to drive – let alone cycle. However, the dangers are greatly exaggerated. 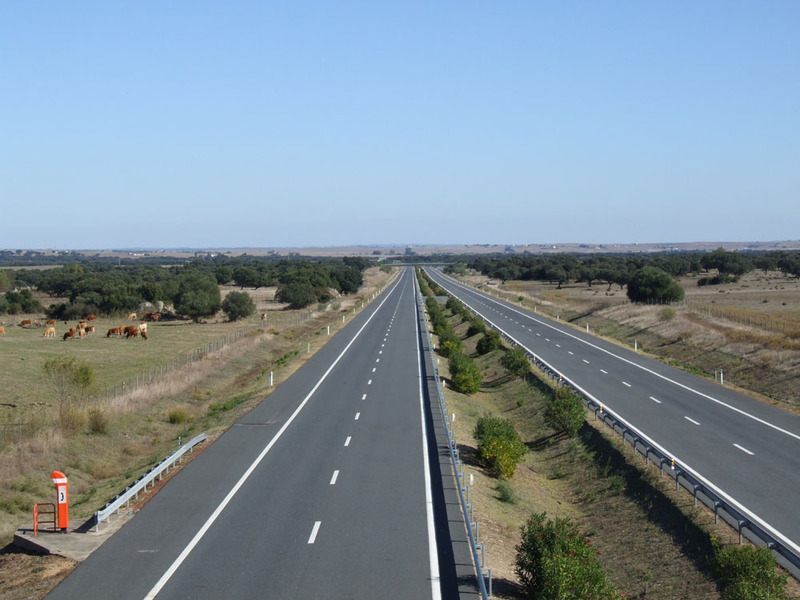 Motorway from Evora towards Spain – taken on a bank holiday weekend. It’s statistics that distort the picture. The thing is that while Portuguese drivers may have more accidents than drivers in other countries, there aren’t huge numbers of Portuguese drivers in the first place and most of them are in the big cities. Portugal’s population is only about 10 million and much of the country consists of rural areas where a bigger issue is actually depopulation. I wouldn’t want you to think there is no danger but as a cyclist, you’re much more likely to be on a country road facing problems like potholes, punctures and where to fill your water bottle than being involved in a major traffic incident. One of the most annoying things about Portuguese drivers is that they very rarely use indicators if they’re about to turn! Some also drive too fast, too close and overtake when it’s not safe… but you get drivers like that everywhere. Drivers quite often sound their horns as they come past cyclists but this is actually just a polite warning and not being aggressive. 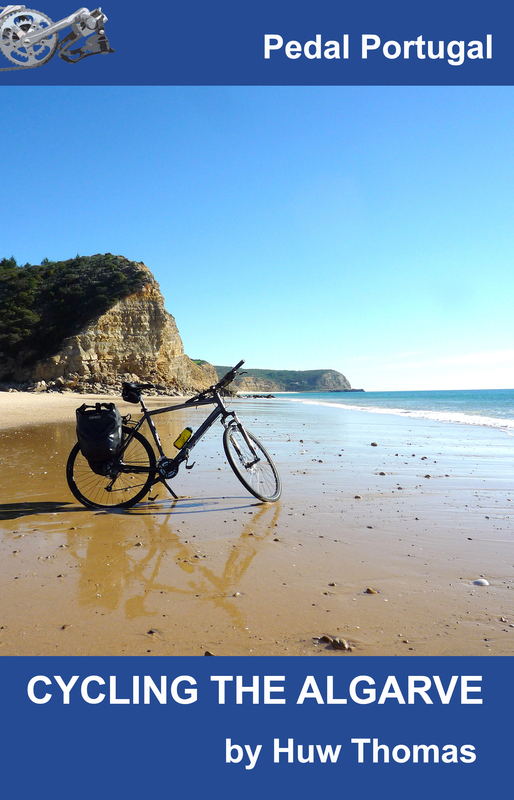 To sum up, in years of living (and cycling) in Portugal, plus riding the length of the country on a previous visit and various other cycling trips, I’ve not had or witnessed any accidents. Stay off major roads and away from big cities and your chances of being involved in an accident diminish rapidly. In fact, in some parts of the country you can cycle for long periods – even on major roads – without seeing hardly any traffic! Road conditions vary from excellent to pretty bad but the majority of roads are okay – helped by the lack of heavy traffic. Portuguese signposting is also generally appalling. In towns they often start okay then disappear completely. (Consistency is not a Portuguese trait!) Rural areas can be even worse. Some parts of the country are worse than others but you’ll often come across back roads that have no road numbering and no sign to tell you where they’re going. Which given the lack of decent maps of Portugal is not very helpful! Other designations you may see include EN (another term for N roads) R (regional) and M or CM (municipal roads). With N roads, those starting with a 1 were originally the most important. Those beginning with a 2 were secondary and those with a hyphen (e.g. N1-23) were branch roads. However, this 1945 system is largely redundant as many roads originally given a 1 are now minor routes of little importance. It’s not a good idea to plan a route using road numbering. A few N roads should be avoided at all costs. On the other hand, I know one road in northern Portugal (the N102 going from Trancoso towards the Douro valley) that has N, E and IP designation. Yet, it’s little more than a quiet country road where you might see a handful of cars every 10km. The basic rule of thumb is to avoid anything that looks like a motorway. If it has two carriageways and crash barriers, it’s probably closed to cyclists. Otherwise, use common sense. 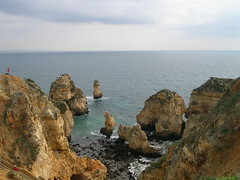 The Basic Facts section gives details on which are the most populated areas of Portugal. And if in doubt, ask. Coupled with the above, the other big problem in Portugal is getting hold of decent printed maps. The best maps are online – Google, Open Street Map and Bike Map – are all much more accurate and up to date than any printed maps. The Portuguese military produces highly-detailed topographical maps – but these are mostly decades out of date. At 1:25,000 and 1:50,000 they are also too detailed and large scale for most cyclists. 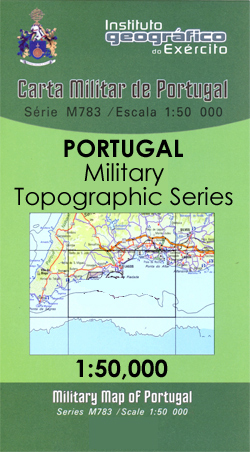 The military maps are available from the Instituto Geografico do Exercito – see www.igeoe.pt. You can also occasionally find them in larger FNAC stores, but not always and they’ll probably only have a limited selection. Most tourist maps are pretty basic, only show major roads and don’t indicate hills. Michelin maps are generally accurate. However, they leave off many minor routes, often showing large blank areas where there are perfectly good roads. The maps are also disgracefully out of date. For example, they still show a railway line (plus stations) in northern Portugal that hasn’t been operational for decades and don’t show a number of new main roads – even as projected routes – despite them having Ibeen open for a number of years. Other mapmakers include Turinita, which has five maps covering Portugal – including The Algarve (1:176,000), Lisbon Coast (1:160,000), North of Portugal and Central Portugal (1;250,000), and The Alentejo (1:300,000). Turinta’s maps are pretty good and show most – but not all minor roads. (Better than Michelin’s.) They don’t have any contours, height indicators or anything to show hills. But they are quite easy to read and give a good overview. Like Michelin, however, they are out of date – showing railway lines that have been closed for decades and not showing motorways that were built 10 years ago. It’s also unlikely you’ll see them for sale anywhere in Portugal so buy in advance. A Portuguese company called ForWays produces a range of regional maps that you can often find in local bookshops/newsagents – although these are not currently available online. Their Alentejo map has been recommended by some fellow cyclists as better than the Michelin version. I’ve got a copy of the company’s Algarve map and it’s quite good (probably more detailed than Michelin) but not 100% accurate – plus it marks some roads that are dirt tracks and leaves off others that are sealed. An alternative option, if touring, simply buy a road atlas and cut out the pages needed – they can be folded into the map case on a bar bag and this often works out much cheaper than buying lots of individual maps. The Map Shop – independent retailer in Upton upon Severn. Pretty basic website but has a good range. And – of course – you can also get cheap Michelin maps (from £4.49) via Amazon. A group of bikers (over 60 y) from Sloweia will in september to Portugal. 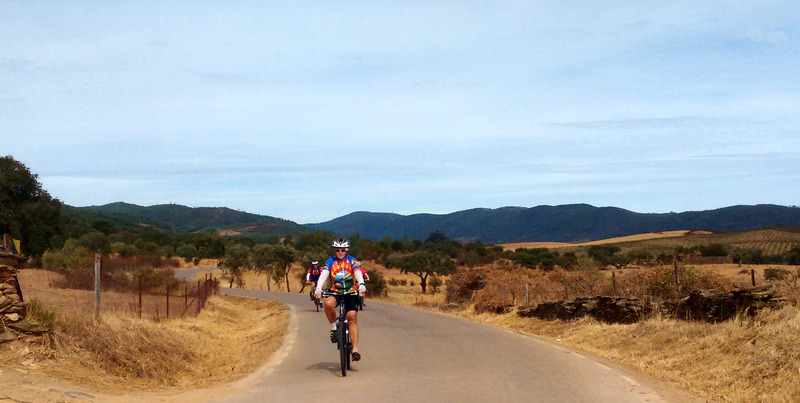 Our biking plan is from Fatima to Santiago de Compostela (Spain). We will come to Lisbon with plain, than with train to Fatima. My homework is to prepare a plan for biking (streets with few traffic). Has somebody experience with biking in this line. So me and my uncle are flying to Lisbon and have about ten days in Portugal. Planning on getting the train to get out of Lisbon. I know it is difficult to summarise, but if you wanted to see lovely villages, countryside and national parks (for both wildlife and scenery), and you wanted to avoid the big hills as fitness levels not so high, is there a route/routes or region you would recommend? Hi Steven. 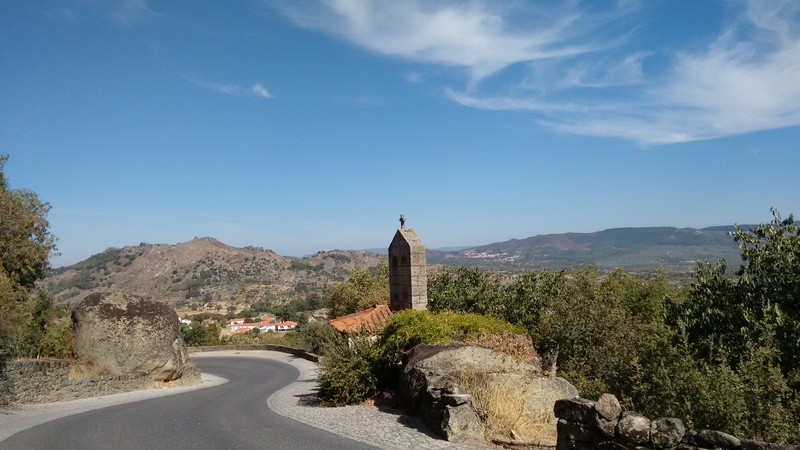 Route depends a bit on the time of year and how far you want to cycle each day but in general if you want more gentle/rolling terrain and wonderful scenery I’d probably recommend the Alentejo. Head for Evora and continue east. Drop me a line via pedalportugal@gmail.com with a few more details and I’ll get back to you. Hi huw. Arriving in Lisbon on the 18th September.11days of cycling. Planning on cycling through the center of the Adlentejo region straight down south to the coast . Can you give me the best scenic route out of Lisbon . Shall we head straight across to Evora or go south alittle and then cut across and also when we hit the Algarve. Best to avoid Faro . 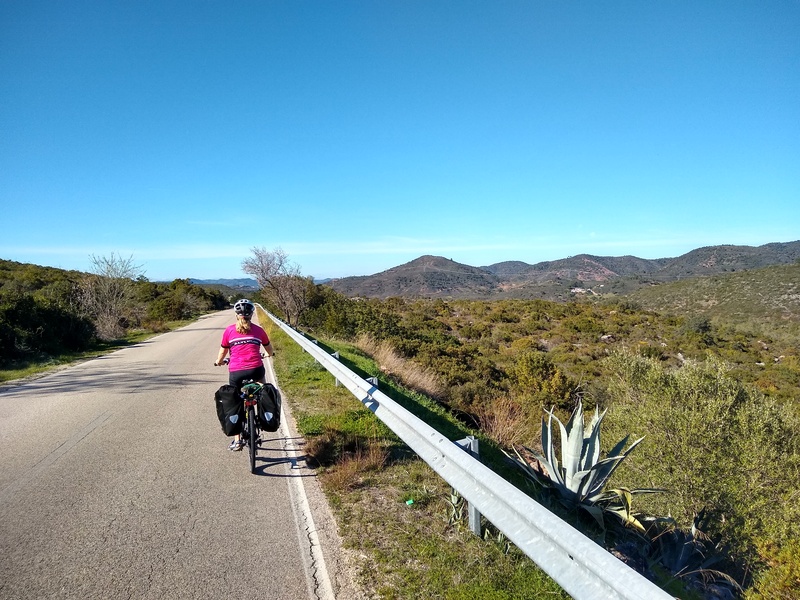 Thinking of cycling towards the Spanish border.i would be much appreciated if you could just jot down names of places and I would be more than happy to follow yr route. Big Thanxs with all the valuable info. Shall be buying maps on line. Sorry for delayed reply – on the road myself. Due east from Lisbon is not very attractive. Would suggest either down to Setubal (by train), then ferry to Troia peninsula, Alcacer do Sal and inland to Evora. Or go north (again I would take train by preference to escape suburbs/very busy roads) to Santarem or similar, then across Tejo and it will all be very quiet as you head into Alentejo. If you really want to ride and have time, go out west from Lisbon to Cascais, up coast to Ericeira, Santa Cruz then loop across to Alenquer and towards Santarem. Route down Spanish border will be gorgeous – Monsaraz, Moura, Serpa, Mertola, Alcoutim and south. Definitely best to avoid Faro. Be prepared for heat – 35C in north at present and 35-40 in Alentejo. Will cool down a bit (I hope!) but be prepared! You can take the bus from Lisbon bus station to Evora. Wrap the bikes in clingfilm first. There is a Chinese shop up the road from the station that will supply wrap. At the bus station do not ask the ticket clerk. Go to the info hatch. The woman there will ring the bus driver and confirm bikes ok. Then just go and buy tickets. Do not mention bikes. The drivers do not have a problem just the jobsworth ticket sellers. It’s a nice journey on an air conditioned bus. About 11 euros each. Thanxs Jim. Makes me laugh the whole cling film business. Many routs out. Hopefully make the right choice on the day.we arrive early so plenty of time to get to Evora with the help of planes, trains, ferry and then a wee few hours of cycle. Just in time for tea and cake. Take care buddy. Sorry but the simple answer is ‘no’! The Douro is a deep river valley and it’s impossible to cycle in this area without a lot of climbing in and out of valleys. Travelling up through Portugal to Spain this May and thanks for the superb web site! Have you tried the app MapsWithMe (or Maps.Me). The maps are for any country and are downloaded and up to date.. You can then zoom in and out so you basically have maps of different scales. Being downloaded it is on the hard drive of your phone or tablet and does not need a signal to operate the map and is not over intensive on battery life. It also has a search function from place names to nearest wifi, ATMs etc. It also has a gps signal so you know exactly where you are on the map in case you just start to wonder where on earth you are! Lastly you can import a gpx track into the app if you wish to follow a certain route. I have used it a couple of times on long trips and found it to be excellent. The price of the app is about £3 but then once this is paid you can download any map in the world. The world has moved on. http://www.openstreetmap.org covers very well. True – but that’s only any good if you’re got some kind of device with web access. Plenty of people still like the old fashioned paper sort of maps – and that’s where life gets tricky in Portugal. One other (printed) map to look out for is by Forways. Their Alentejo map has been recommended as more detailed than Michelin etc. I think they also do maps covering other parts of the country – but you can only get them in Portugal. I did your suggested Alentejo circuit in last week of March. My entire tour was based entirely on information you provided. A big thank you. It is a great service. I am happy to provide my experience for the benefit of others. I am not sure which section I should write. Perhaps I will write in different sections. I mapped my entire route on Google maps. 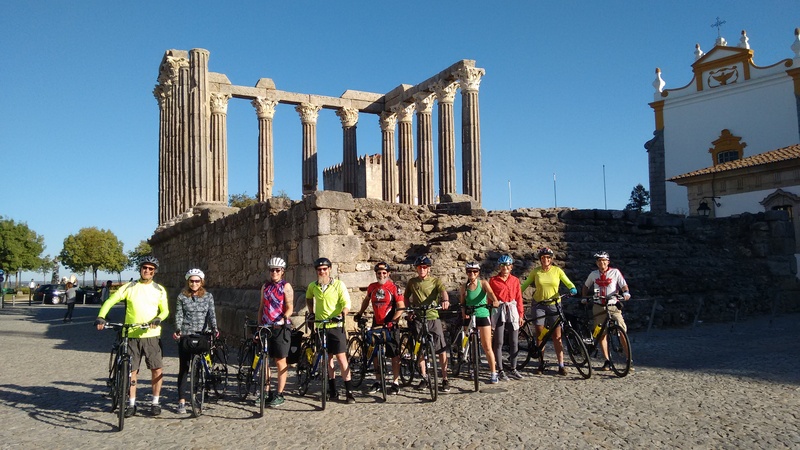 I cycled from hotel to hotel covering the Alentejo route over one week. I mapped each day on Google maps and downloaded it in to my Garmin Dakota 20 which had a standard European map on a SD card. I had no problems in finding my way. On one occasion, the GPS directed me on a road not suitable for Road bike. But I was able to ignore that and stay on the main road and re join the rest of route on my GPS device. That is in fact my problem as I should have checked the route on Garmin Basemap after I have uploaded the route. The map on SD card had all minor routes. Interestingly, it proved very useful in Lisbon where I spend half a day before catching the flight back to Luton. So my advice is that don’t worry too much about maps. Google maps with or without GPS and some common sense is good enough. You won’t get lost. Perhaps the problem is our mindset or attitude to road signs and maps. We, the British, are so used to having too much road signs. We get warned about a corner or any change in route several times before we actually approach it. I say that Portuguese still navigate the way as Vasco De Gama went to see. You can see this clearly in Lisbon Metro and airport. There are absolutely no indication on which level is departure or arrival, existence of another Terminal etc. I was not sure till got down at Luton, I was actually in the correct flight! With regard to road safety, it is relatively safe because there are hardly any vehicles. The drivers are considerate, they don’t find you annoying or nuisance but they simply have no clue how to react to a cyclist.Even the Police blow their horn before they pass you! You hardly see a local cyclist on the roads. In deserted country roads, you come to a corner, there is big white line on the middle of the road yet the vehicle behind will overtake you giving you a wide space. You both survive as the chance of a vehicle coming from front is extremely rare. I said that to indicate how and why you need to judge the situation.